We’re based in the UK, in the heart of the Nottinghamshire countryside. Do you charge travel costs for weddings in the UK? We try to include our travel costs whenever possible, however if you’re particularly far from us then we may need to travel up the night before so we’ve got plenty of energy for your day. This means we’ll need you to cover our travel and accommodation costs. Something cheap and cheerful is fine! Yes we travel all over the UK and internationally for weddings and elopements. Yes absolutely! For weddings in Europe, we typically charge £500 to cover our travel and accommodation costs. If your wedding is further afield, just get in touch to tell us the location and we can have a chat to agree on a reasonable fee. We photograph in a contemporary documentary style. This means that on the day our approach is very relaxed and natural, focusing on the real moments. More than anything we just want you and your guests to be yourselves, enjoying your day, with us quietly capturing the story for you. Do you always photograph together? We love to photograph together and whenever possible we prefer to. However, we’re also very happy to shoot solo for smaller days, elopements and couple sessions. Everything we possibly can. We photograph full days, from getting ready in the morning until well into the night, leaving when we’ve captured a real sense of the party. There’s no hard and fast rule but we’re likely to be with you for at least 12 hours. Our approach to your day is natural in style, however we know how important it is to have a few family group shots. We just suggest that the combinations are kept to about 6-8 groups so that they don’t take longer than 15-20 minutes. If you’ve decided you’d like to book us for your day, we will email across our booking form along with your invoice for a deposit of £400. Once we have received these, that’s it, the date is yours and we refuse other enquiries on your date. 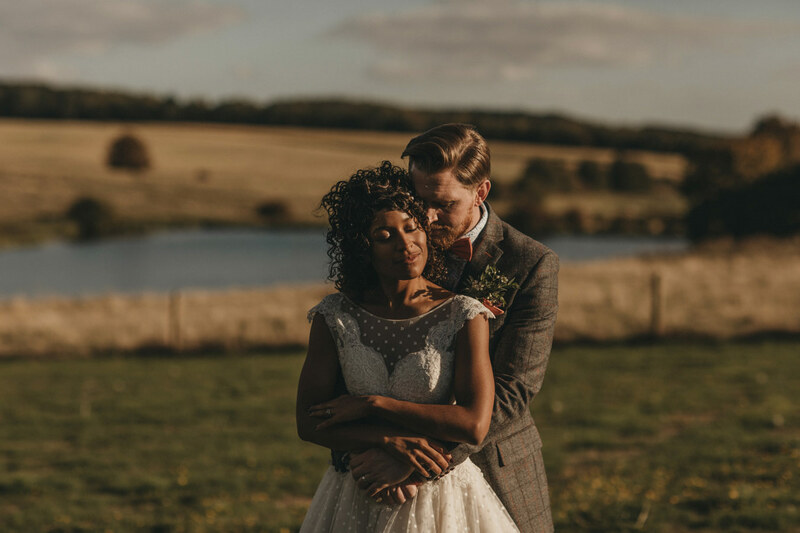 We ask for the deposit plus any travel/accommodation expenses at the time of booking, with the final balance payable no later than 14 days before your wedding date. It depends on the time of year but typically between 6-12 weeks after your wedding. It really depends on the length of your day and size of your wedding but we aim to deliver a minimum of approximately 500 fully edited images from a full day. The copyright of the images always stays with us as the photographers but we give you the right to reproduce the images in any way you wish. The only thing you can’t do is use the images for commercial use or re-sale. Your photos will be delivered via a private online gallery and on USB. As soon as they’re ready we send an email with a link and password to your gallery. Your images can be downloaded and the gallery shared with family and friends. We then prepare your USB box and send it through the post shortly afterwards. Definitely, we love images in print rather than sitting on hard drives! Your photographs will be delivered in high resolution and ready to print. You’ll be able to print straight from your USB or download and print images from your online gallery. We also offer the option to buy prints through your online gallery but there is no obligation to do so. Yes we do and if you’re not usually that keen on having your photograph taken then this is a great opportunity to get used to the camera (and us) before the day. Our sessions usually last about an hour or so and are always a laid back and fun way of making some great portraits of you together. Of course, we always prefer to meet before your wedding day if possible. We don’t want to be strangers on your day so we’d love to get to know you a little better. We’re happy to meet up for a chat somewhere but if we’re too far away from each other then we’ll arrange a Skype chat instead. Yes we offer a range of fine art albums. Once you’ve received your images, you can buy albums through your gallery store. We’ve never believed in trying to up-sell albums at the time of booking, so this way you have the freedom to choose what you want, when you want, with no catches. Absolutely, we have professional indemnity and public liability insurance. We are happy to provide copies to your venue if needed (as they sometimes ask). We shoot with professional Canon digital cameras and lenses and always carry back-up equipment. We hope our wedding photography FAQs have answered everything but if there’s anything else you’d like to know then just get in touch!